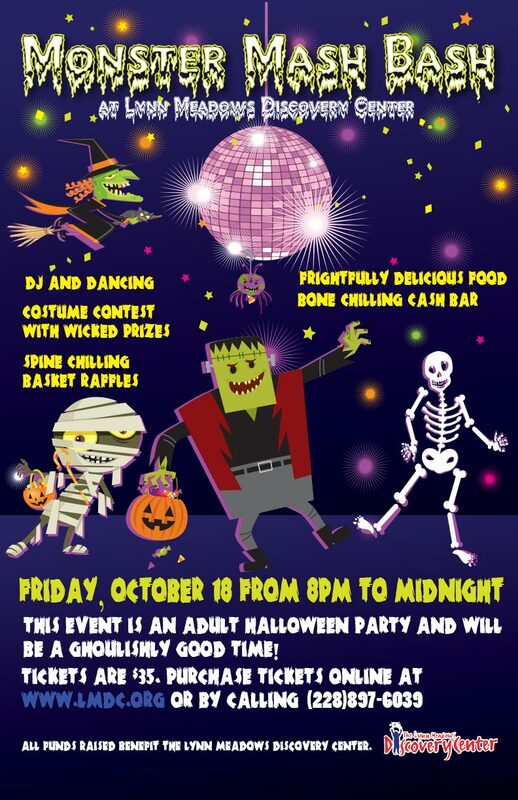 Enjoy a ghoulishly good time at Lynn Meadows Monster Mash Bash on October 18th from 8 p.m. to midnight. The adult’s only Halloween party and fundraiser promises to be an evening filled with excitement and frightfully delicious food and spirits. A DJ will provide music for you to dance the night away while you support children along the Mississippi Gulf Coast as they make a connection with all things related to the arts. When you attend the Monster Mash Bash, you will be investing in the lives of children from all around the country and the world because Lynn Meadows Discovery Center is a popular destination place for families when they visit the Mississippi Gulf Coast. The LMDC introduces children to interactive play and promotes the arts through music, theater and dance programs at the Wings Performing Arts Center as well as national and international exhibits, artistic expression through crafts and healthy, outdoor play. There are so many things for kids to do at LMDC that you can visit day after day and never cover all of the areas available. The Monster Mash Bash gives you an opportunity to bid on very special gift baskets filled with restaurant gift certificates, a big tailgating basket bonanza and an IP Hotel/Casino pack that offers spa, hotel and restaurant certificates. Tickets to the event are only $35 and may be purchased online at http://www.lmdc.org or by phone at 228-897-6039. LMDC is also raffling a beautifully handmade playhouse constructed and donated by a local artisan. Tickets for the raffle may be purchased in the admissions area or by going to http://www.lmdc.org. You can buy one raffle ticket for $10 or 3 for $20. The drawing for this perfectly sweet playhouse will be at midnight during the Monster Mash Bash. The winner will be posted on the LMDC website and notified by phone. The winner must present their ticket receipt and original proof of ID to claim the prize. Another fundraiser for LMDC comes in the spring of 2014. The folks at the discovery center love to bring the Boogie Nights fundraising event to the coast every year. They are currently collecting silent auction items for the spring. So, attend the Monster Mash Bash in your favorite costume and drop off something to donate to the Boogie Nights silent auction while you’re there.